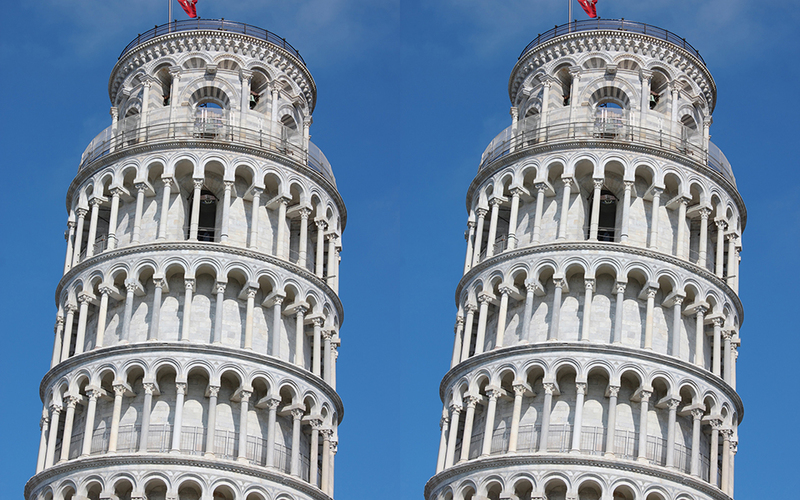 Illusions like the Tower of Pisa illusion give us proof that our brains use rules to navigate the world. When 3-D is placed on 2-D this often tricks the mind into “seeing” differently. So, what does this mean for architecture? How is the 2-D within architectural design evolving? Why is the use of surface so important? What new illusions might we uncover in the future as the use of surface in architecture continues to advance? Since early times, 2-D surface has been used to create illusions and representations of our 3-D world. At times, our eyes navigate 2-D surface using 3-D navigation rules. This is most evident when we see perspective drawings on a canvas or building surface. Artists and architects alike make the most of our visual sensory system to use surface to create space. Within architecture, for example, the use of perspective on actual building surface can greatly modify spatial character. Nanotechnology is also changing the way architects and designers think of surface. As materials are constructed at the atomic and molecular level, nanotechnology has the power to alter material behavior. Such materials may be used to construct architecture and may transform the way occupants expect materials to perform. As materials become stronger, lighter and cleaner, surface applications will fundamentally change. Just imagine a surface that is perceived as strong and durable as opposed to vulnerable and delicate. The possibilities are immense. Surfaces are becoming increasingly transient. As we advance further into the future, smart materials will continue to advance and alter the way building materials function. Now, we have glass that can change transparencies and sensors that can actuate LED surface lighting. In effect, the notion of “surface” is changing, and our perception of what we think 2-D space can do is expanding. We have come a long way from discovering the rules of perspective; yet, we are just beginning to understand the brain, its systems and the illusions that define them. Still, it is with the advancement of “surface” that 3-dimensional space continues to evolve – a direct influence from the human sensory system and how it navigates the world. (1) Macknik, Stephen L. & Martinez-Conde, Susana. A Perspective on 3-D Visual Illusions. Scientific American Mind Magazine. October/November 2008.